GLR Kokolatte as a cria was as cute as they come. She is without question our favorite modern grey foundation female. A Synergy daughter with a Seattle Mist mom, she is dark silver grey, upright proud and deep dark silver grey. She has coverage and then some, from her wooly ears and beard all the way down to her toes. Her fleece is greasy and dense and has a micron count of 20.1. She was Reserve Grey Female Color Champion at the 2012 Mapaca Show, 3rd at the AAA Futurity and Color Champion at the 2012 AOBA Nationals. She is the sort that turns heads with her striking looks and presence. 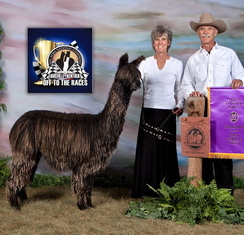 She has a beautiful jet black 2014 Rastamon daugher, GLR Korinna who did well on the circuit at the biggest shows and was purchased by Linda Kondris of Pines Edge Suri Alpacas. Kokolatte's 2014 female cria GLR Kaiya was a fawn female who placed in the top of her class in 2015 at two of the biggest shows of the year. Kokolatte's 2015 female cria, GLR Cocoa is almost a clone of her mother, but sired by Rastamon. Definitely as high on the "cute factor" as her mother as a kid, Cocoa, at her first show in 2016 as barely a six month old won the Reserve Grey Female Championship at the AAA Futurity. 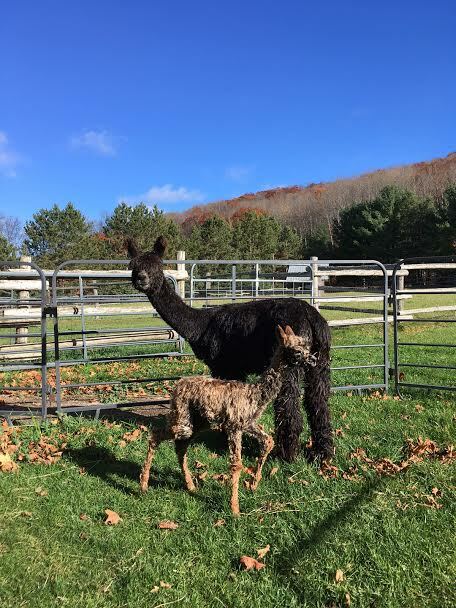 Kokolatte is bred to Granite's Tribute to Roy, for a Summer 2019 cria.